As enterprises have become more dependent on IT, their continuous availability, disaster recovery (DR) and business continuity requirements have become more demanding. Moroccan Government and Bank Al Magreb regulations are more stringent as well. To address today’s stringent requirements, customers need Active/Active (A/A) Sites solution. A/A Sites is two or more sites separated by extended distances(less than 100km in most cases) running the same applications and using the same data to provide cross-site workload balancing and continuous availability. It’s a fundamental paradigm shift from a failover model to a continuous availability model. Many companies and businesses require that their applications be continuously available and cannot tolerate any service interruption. Many consider a loss of a disaster recovery backup to be a severe impact to their business. If their local production site fails, swapping to a DR site allows applications to continue running. However, without another DR to act as a backup for disaster protection, many business applications are left unprotected. Unclear definition of Active-Active : different clients and different vendors (IBM, EMC, HPE,…) had different understanding and explanation of Active-Active Solution. In order to build an Active-Active solution, each tier of workload need to be considered. Since Active-Active design at Web Server, Java / Application Server could be achieved through load balancing mechanism to dispatch workload across multiple sites. The key of Active-Active solution design really come down to database server design (resolved by using features like Oracle Real Application Cluster and DB2 PureScale) and in some case the shared filesystem design. The IBM HyperSwap function is a high availability feature that provides dual-site, active-active access to a volume. HyperSwap functions are available on systems that can support more than one I/O group .HyperSwap volumes have a copy at one site and a copy at another site. Data that is written to the volume is automatically sent to both copies; if one site is no longer available, either site can provide access to the volume. HyperSwap is introduced as a facility of PowerHA SystemMirror for AIX Enterprise Edition in combination with select storage subsystems. 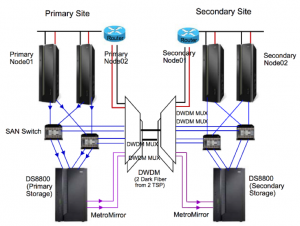 This facility supports stretched cluster and linked cluster configurations. 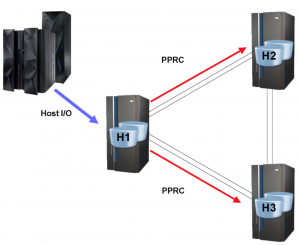 IBM Multiple Target Peer-to-Peer Remote Copy (Multiple Target PPRC) enhances a multisite disaster recovery environment by providing the capability to have two PPRC relationships on a single primary volume. This adds data protection because there is an additional remote site. In other words, with Multiple Target PPRC, the same primary volume can now have more than one target, which enables data to be mirrored from a single primary site to two different target sites. IBM DS8880 all-flash machine types offer the exceptional performance and economic benefits of flash storage while maintaining enterprise-class reliability. The IBM DS8880 family offers three all-flash array models, DS8884F, DS8886F, and DS8888F, to meet the demand for higher speed storage. All-flash arrays deliver higher IOPS and bandwidth with lower power consumption to reduce the total cost of ownership as compared to hybrid or HDD-based solutions. All models are based on the second generation of the “High-Performance Flash Enclosure” (HPFE Gen-2). 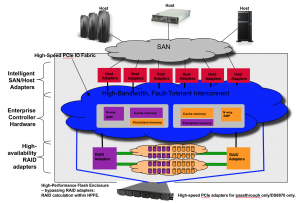 HPFE is a dedicated flash architecture with all-Custom Flash Hardware (CFH), which is specifically designed for the high IOps counts that take place when using flash. HPFE Gen-2 comes in paired enclosures of up to 48 flash cards, which as special hardware have the so-called “Microbays” in the rear. a PCIe switch card. The switch card carries the signal forward from the Flash RAID adapters over via PCIe Gen-3 directly into both processor complexes of a DS8880F. The Flash RAID adapters go with 8 SAS connections per Microbay pair to a pair of the specific flash enclosures, that hold SAS expanders and the flash cards. 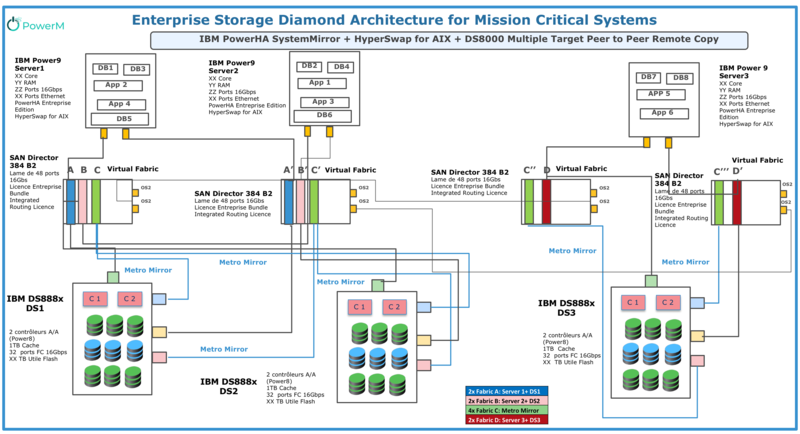 With AIX and DS8000, AIX HyperSwap will deliver both a high availability and a disaster recovery solution in an MGM three-site solution. PowerHA will provide management for HyperSwap. CSM will manage initial multi-target MGM setup, failback after HyperSwap, and Site Swap to the disaster recovery site to deliver high availability and disaster recovery in the multi-target MGM PowerHA environment. The synergy of PowerHA, DS8000, and CSM deliver a seamless, end-to-end solution to meet increasing business demands where critical applications need to be available all the time, and the system needs to be fault tolerant. In order to provide 3 site support for AIX PowerHA HyperSwap customers, Copy Services Manager, AIX PowerHA and DS8000 worked together to provide solution allowing customers to setup PowerHA HyperSwap on the Storage1Storage2 pairs managed by Copy Services Manager. Using a Copy Services Manager Multi-target MM-GM session ,a customer can setup the replication with Copy Services Manager’s ease of use and then provide high availability for those volumes by using PowerHA HyperSwap. When a HyperSwap is triggered on the H1H2 pairs in the session, Copy Services Manager will recognize the event and move the relationship to Target Available allowing the customer to then issue the Start Storage2->Storage1 Storage2->Storage3 command to restart replication across all three sites again. With Copy Services Manager’s ease of use in managing a three site environment, and the high availability capabilities of PowerHA HyperSwap, a customer has a great solution for managing their replication.